Comfort as you have been comforted. And if you are in need of comfort, I pray you receive it now and eternally. This entry was posted in Uncategorized and tagged grace, oppression, patience, Rebecca Trotter. Bookmark the permalink. This. The reason for being. To find the pain under the behaviours we so often judge, then love, comfort and accept that person right where they are, as they are. Speak words of love, acceptance, hug, touch, smile, allow trust to build, or not, then let your heart sing as you see them start to bud. It might be a rather warped, angry and sad bud, but flower it will, and then the glory and joy of a heart eased is almost too much too hold. Then cry a lot and rejoice in The Lord. “the glory and joy of a heart eased is almost too much too hold” – Beautiful, Ruth. Yes, but we should still exercise wisdom. I spent a decade of my life trying to love a man who was very much in pain. The trouble was he used it as an excuse to hurt me and to make sure his needs always came first, mine never. Loving is not optional, but someone who deliberately hurts others and uses their own pain as a ‘reason’ for their destructive behaviour is not ready to be loved. Co-dependency is not love. I know you’re not trying to say that it is, but I also know that people like I once was would read the above to mean that putting up with abuse is ‘loving’. It’s a fine line. It takes courage and wisdom to see beyond anger, etc., and see the hurting human. That is a good distinction, sfk. The quote is aimed at those who reject the hurting out of hand because all they see is a bad attitude, not the cause of someone’s pain. What you describe, though, is someone who is not really oppressed but rather oppresses others through manipulative behaviors. Absolutely, yes. It takes wisdom to know the difference. Thanks for this, Tim. When we offer conversation rather than correction, there is hope for reconciliation and healing. When we grant others the right to express their feelings in their personal psalm language recognizing that Jesus invites us to come before Him with all manner of conversation or speech, there is hope for reconciliation and healing. When we recognize that trust is the bridge we are compelled to build for those who are hurting (oppressed) there is hope for reconciliation and healing. When we live out before others a high view of grace, for them and for ourselves, the grace to listen, not just hear, each other brings hope for reconciliation and healing. Tim, your high view of grace is a refuge of reminder for me–and many others. Again, thanks. Reconciliation and healing are truly a ministry of Christ, Rick. Thanks for the reminder. Tim, I appreciate your reply–I laughed a bit at myself as I read my original post–I was so declarative and imperative in the way I wrote. I think the manner in which I wrote it would be a conversation ender rather than starter. Over the years, as I learn, (slow process), to ask more questions, to be gentler in speech, this reminds me how easily I fall into a default behavior about that which I feel so strongly. I actually thought each of your points were well stated and worth reading, Rick. Please keep it up! Wonderful reminder, Tim — thanks for sharing this quote. 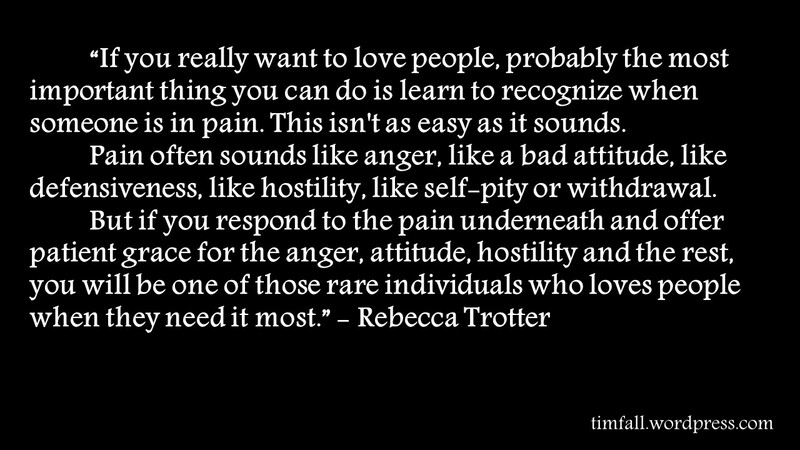 Rebecca put it so well. It can take a lot of patience but that is one of the gifts promised through his Spirit, so it can be done! Spirit led and Spirit reliant, that’s how I get anything done that is truly worth doing.